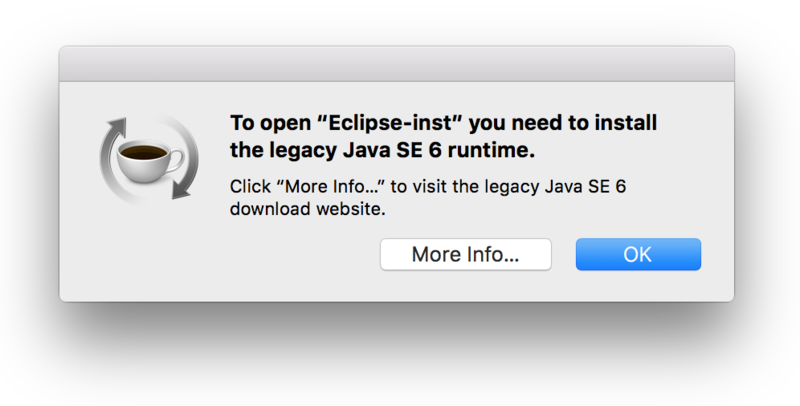 Asking me to install Runtime Java SE 6; I have already installed Java 7, and if I press Install in that dialog, download and install it, and open Eclipse again, the dialog appears again. This is in part due to Oracle's missing definitions of the JRE8 VM capabilities. Afterwards copy the file back to its original location (you need administrator rights). For this change to take effect you need to log out of your account (and back in) or restart your computer. The dialog for Java 6 should shouldn't appear anymore and Eclipse should launch just fine using JRE8 (or JRE7). The same holds true for any other application that initially asks for Java, e.g. Adobe's Creative Suite. On a related note it appears that this plist change sticks even after updates done through the Java Preference Panel in the System Preferences. To be able to run Eclipse with Java 7 (Oracle), I launch Eclipse using this file: eclipse/Eclipse.app/Contents/MacOS/eclipse. "eclipse" folder contains alias for this file by default. 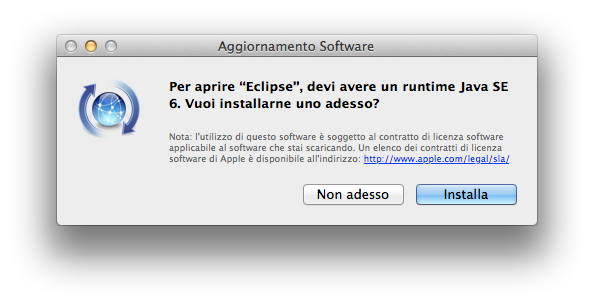 So all that you need to do is to double-click the alias named "eclipse". Also Oracle warns that Oracle's Java version 7u25 and below have been disabled by Apple on OS X (see here). I had upgraded to the latest JDK version before I found out the way of launching Eclipse with Java 7. So I don't know if the upgrade is necessary or not. You need to download and install the JAVA for MAC manually. That is what worked for me. I happened to get it running without a procedure like the suggestions above. I erased the eclipse folder and then copied it back from the trashcan. Please verify if it works for you. On MAC OS X, after installing JRE 7 from Oracle using the .dmg download, on opening Eclipse, it still pointed back to my old JRE 6. After numerous google searches for the problem, and getting here, in desperation I clicked on "Search" in Eclipse --> Preferences --> Installed JREs and voila - it picked up JRE 7.
after installing Java 8u72 JDK for OS X downloaded from Oracle website the installer runned without issues and the same was with Eclipse itself later on. Not the answer you're looking for? Browse other questions tagged java eclipse osx-mavericks or ask your own question. How to set or change the default Java (JDK) version on OS X?